Two mailers came today. 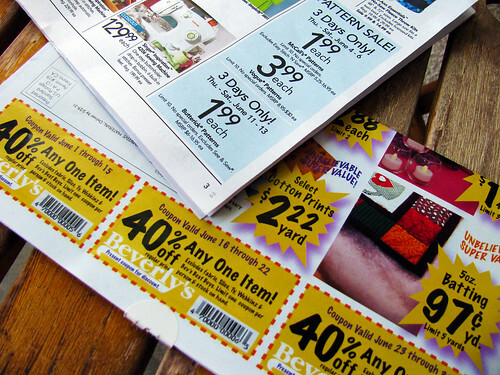 One from Beverly’s with 3, count them, 40% off coupons. I see more sock yarn being added to the stash in June. JoAnn’s also has a good deal on patterns too. I haven’t had time to sew up the ones from the last sale. So I will pass on this sale. I had a weird day. First I was all set up to get a couple hours knitting on the patio this morning. It was beautiful out. I had tea and cushions on the chairs. I had only knit one row before the jack-hammers started. A neighbor is tearing up his 5 year old patio. They are crazy here outdoing each other on the backyard renovations. I want the power tools to stop, just stop. Next my son brings in the mail and his tax refund check came. Only it is 4 times more than he is supposed to get back. I called and waited, and waited,and… Finally I am told that the IRS corrected his form, but it didn’t need to be corrected. He didn’t claim an exemption because we claim him as a dependent. We have to send the check back with a letter explaining why we are sending it back. The check was for about $300 more dollars than he even had withheld. How many other college students also get corrected forms and a bigger refund? Needless to say my son was disappointed. He needs the refund money now. So I will advance it to him and hope that the IRS can fix their mistake in a timely manner. When Rick came in he told me he saw one of my favorite actresses today, along with a couple of other really famous ones. They were all there to read for Rapunzel, the next Disney Princess movie. I asked if I could write the names, but Rick said no. He has a confidentiality agreement. I want to talk about who would make the best Repunzel with you all. So all in all a weird day. This entry was posted on Wednesday, May 27th, 2009 at 3:00 am and is filed under Craft. Tagged: Craft. You can feed this entry. You can leave a response, or trackback from your own site. Oh no! I understand fully about the jack hammers – you are just getting settled in, looking forward to a lovely time and BAM! That is the worst. I hope the IRS thing works through and good on your hubby for respecting his confidentiality agreement (and you, too). Oh those confidentiality agreements spoil all the fun! LOL!